Dementia Australia has a long, proud history of serving Australians who are affected by dementia. We are Australia’s Dementia Experts. In 2018, Dementia Australia represents more than 436,366 Australians who are living with dementia, and the estimated 1.2 million Australians involved in their care. We advocate for the needs of people living with all types of dementia, and for their families and carers, and provide support services, education and information. Dementia Australia is a member of Alzheimer’s Disease International, the umbrella organisation of Dementia and Alzheimer’s Associations around the world. We are immensely grateful for the generosity of our supporters whose vital donations help us to develop and provide the best possible support services, while investing in innovative research that will result in better treatments and, eventually, a cure for dementia. 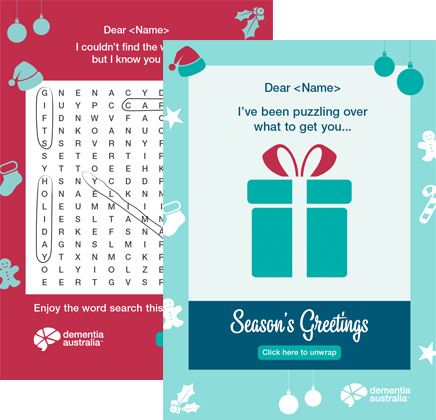 Your eCard will help raise funds for research, and provide vital support for people living with dementia. Choose an eCard, add a donation and give a fun gift that shows you’re committed to solving the world’s hardest puzzle. © 2018 World's Hardest Puzzle. All rights reserved.